And now, a comic strip - Action figures revolt! Hopefully you all had a chance to check out Charlie Bennis's awesome "Soup-er Man" this morning, but we've had so many great entries that we're not slowing down a bit. So, I thought we could dive into our first full-fledged comic strip on this fine Tuesday afternoon. This one comes from Isaac Reichenbach and it definitely put a smile on my face. Take a look at it and you’ll see why (click it to enlarge it and get a better view). 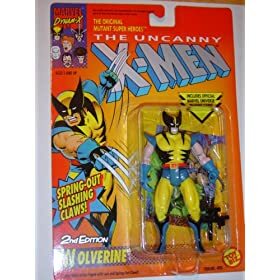 Now the reason I enjoyed this so much is because my initial passion for comics was significantly influenced by the fantastic offering of X-Men and Marvel Superhero toys with which Toy Biz seemed to dominate the action figure aisle for quite a few years. You see, I had the Marvel Superheroes Board Game (somewhat chaotically seen here), and my best friend and I would use my various action figures to act out the battles fought in the game. For hours. Tons of hours. That said, I’m very glad that Isaac’s vision of the toys’ revenge never became a reality for me. It would have been a sad day when my beloved Captain America and Wolverine figures turned against me by pairing with Magneto and Venom for a full-fledged toysault and battoyry (did I try too hard there?). Needless to say, I survived my childhood experience unscathed. Which is why it’s funny to laugh at the kid who did get beat up by his toys. Thanks for the great submission, Isaac. You mentioned that you don’t make a ton of these comic strips, but I certainly enjoyed this one and would love to see what you come up with in the future if you try again. So, we're now diving into both superhero (or Souperhero) designs AND comic strips themselves. Lots of bases being covered, all of them totally rad, so keep sending in your submissions to kiel@pickfresh.com and we'll be sure to include them in the week's postings. I'm looking forward to posting the new ones and hopefully adding my thoughts (as long as you guys aren't tired of hearing me ramble about my comic love). Leave your comments and let me know what you think. I'd love to hear what you readers/viewers have to say (and I'm sure the artists wouldn't mind some appreciation either). Thanks, and we'll be back with more soon! Here at the GC desk, we need a constant flow of music or we completely shut down. Then we have to hook up Menke's Amazing Art Machine to the Mac to do our work for us. Just kidding... kind of. But we do listen to music constantly. And we love us some locally brewed tunes. When we first went to Fly Away Sparrow's MySpace, we thought "Wo-Ah". This is some great, great, great stuff. Legit. Born in the dusty Midwest, FAS has a great folksy, indie, LaMontange-esque sound and a polish unlike anything we've heard locally. Check this out! Isaac Reichenbach, the Traveling Designsman, sent over this poster he did for the Fly Away Sparrow release party at Latitude 44 on Thursday. -Check out Fly Away Sparrow. -Check out their album and it's release party at Latitude 44 on April 23rd, 8.00 pm. That last one is indeed watercolor, not ink wash. The photos include his mother ("back in the day") next to the Golden Gate bridge and some Augie friends "running through" the grass. If you would, please, contrast these sepia-ish images with an early Reichenbach photo project with books and toys here. He can do it all! Color, sepia, he's got artistic skills in all different area codes. He's the Traveling Designsman. Have a good weekend all. Watch out for instances of Upstaging. And keep making... everything. Here at FP Headquarters, we recently had the extreme privilege of having traveling designman Isaac Reichenbach stop by and give us some musings on the ol' chalkboards. He just walked in, grabbed a piece of chalk, and whipped up this wonderful piece for us. If you aren't able to stop by and draw on our chalkboards (which you are all welcome to do), send in jpegs of your work to kiel@pickfresh.com to get your work posted on Graphic Content. We received this wonderful piece from long time GC fav Isaac Reichenbach over the weekend. That infamous duck of his has found it's way into the 3D realm and we love it. Perfect capture of his trademark duck. Is that color pencil on the cheeks and eyes? Won. Der. Ful. Even the pictures he sent in are spectacular. I didn't even touch the Levels or Curves at all! The presentation was too good. And we wanted to cut the submission down to two pics, but we couldn't! We had to post them all! Ahhhhhhhh! Anyway, thank you Isaac Reichenbach. Graphic Content would like to direct you to more Reichenbach goodness elsewhere on the web, but he has completely deleted his digital fingerprint. Where in the www is Reichenbach? We have no idea. Sioux Falls/Augie Alum and GC fav Isaac Reichenbach sent me a bit of what he's been up to. This is a gig poster for a show in LA. Does this mean Isaac is in California?! Has he joined a rock band?! Or, more likely, is he a traveling designsman, hocking off design work on the side of the road from his Macbook Pro and CS2 as he travels up and down the west coast?! Well we really don't know because he won't answer our emails. He only shoots us a random project or two. As always, we find Reichenbach's designs fresh. There's something classically hip in the work while keeping that heathy dose of unexpected that is Reichenbach. Send your own artwork in to kiel@pickfresh.com to get your work posted on Graphic Content. For today's entry, GC fav Isaac Reichenbach provides us some gems from his sketchbook. These were done over Valentines Day, where Isaac spent the entire day in a coffee shop, sketching and making general observations on The V-Day. Enjoy. Hilarity ensues. Our fav is the one with the giraffe. There's like 6 different things we like: a giraffe, a giraffe smoking a pipe, chess, Isaac-esque characters, pro loneliness statements, and ...did we mention the giraffe? Isaac, good one again my friend. Keep 'em coming. Send your own work in to kiel@pickfresh.com to get your work posted here. Not too long after our first bout of photography comes another bunch of photos, this time courtesy of Isaac Reichenbach. The colors are wonderful and the images playful. Give 'em a gander. Hey, Isaac! Make more of these. Send your own work in to kiel@pickfresh.com to get your work posted on Graphic Content. I don't mean to be insulting... but GC is really lacking in the Duck department. We really have nothing more to say. Thanks, Isaac, for addressing our incredible lack of duck-age. These hard economic times are effecting all of us. We've got some more of Reichenbach's work to post this week so tune in tomorrow! Send your own work in to kiel@pickfresh.com to get your stuff posted today. Isaac Reichenbach sent this banner in last week and we had planned on posting it at the beginning of this week but then the TT's the Pond project came along. So, without further ado, we're posting Reichenbach's new banner and I've also attached an image we ripped from his website that I think is pretty great. Keep up to date with Isaac Reichenbach at his newly reformatted website turned blog- HopelessRoadmantic. If you'd like your own stab at our banner or have any sort of art you want to share, send your stuff in to kiel@pickfresh.com. Tune in tomorrow for possibly more local art or possibly the TT Pond pics we got yesterday or possibly more of my doodles or possibly whatever you send in to me over the next 24 hours.